In this quick game for parents and kids, you're capturing dinosaurs for your zoo. Roll the dinosaur picture, and you caught him! If you get a leaf, the dino is hiding, and you can try again. If you get a footprint... you're STOMPED! Push your luck to catch as many as you can, but stop rolling before you're stomped three times, or you'll lose them all. 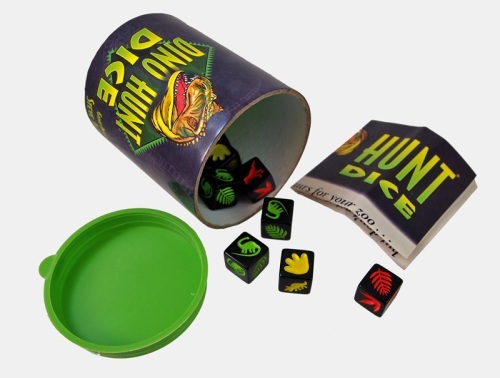 Dino Hunt Dice is a game for 2 or more players. Each game takes 10 to 20 minutes, and can be taught in a single round. While the adults are playing Zombie Dice the kids are in their room playing Dino Hunt. Same game just dinosaurs instead of flesh eating zombies. That being said I it really doesn’t bother me having the kids play one or the other it’s just a dice game after all. We play both all the time on family game nights. The only real reason I bought it was because us parents got tired of sharing the game with the kids. Steve Jackson’s 2010 release, Zombie Dice, is a fun, simple filler. I am not sure why 2012 saw the release of Dino Hunt Dice. It is a cheap, lesser rehash of Zombie Dice. Dino Dice has smaller than standard dice, and the icons are not nearly as distinct and easy to ready as those of Zombie Dice. I know that there has been a zombie craze for some time, but I don’t recall a recent increased interest in dinosaurs. The game works as a filler, and it is inexpensive. Dino Hunt Dice lacks the quality feel of its predecessor, so why choose it when Zombie Dice is clearly better. Maybe some folks don’t like zombies. Add a Review for "Dino Hunt Dice"